Sticky hands is one of the most challenging and problematic, but ultimately one of the most fascinating and rewarding aspects of Lee style T’ai Chi training. Yoga, meditation and Qigong classes tend to concentrate exclusively on solo exercises, but one of the great strengths of T’ai Chi is that it has this interactive element. Chee Soo was interviewed by Brian Hayes on his LBC radio show and talked about how T’ai Chi teachers who are only teaching forms are only teaching a segment. People are going to T’ai Chi to learn how to relax, how to focus and how to maintain their balance, and learning about posture and copying forms from the teacher can go part of the way with this. However you need feedback if you are to get any real insight, and balance needs to be tested dynamically. What you learn in a class is only of real value if you can put it into practise outside the class, and you can only really learn how to keep your balance if someone is trying to upset it. Chee Soo has written an introduction to sticky hands in his T’ai Chi book and it gives many valuable insights, he emphasises sensitivity. At our Summer Course in Cornwall this year we started with the most simple and basic version of the exercise which is only touching with one hand. The contact area is anywhere on the arm, including the shoulder blade, and you can learn to vary your point of contact even with this restriction. You can use the palm of your hand, the edge, or the back of the hand, or you can even use the forearm, the elbow and the shoulder in some situations, remembering that you can only touch anywhere on your partner’s arm and not the rest of the body. The other golden rule with this exercise is that you must stick, and this means not breaking contact. Also you must not move your feet, which includes lifting the toes or letting any part of the foot lift off the ground , if this happens or you have to step then you have been uprooted and you should change stance to the opposite leg. Finally you must not be tempted to use force, even if you do uproot your partner, if you have used force to do it then it doesn’t count. The ultimate in this exercise is to have maximum effect but with minimal effort. The key here is understanding your partner’s intentions and anticipating what they are about to do, and then you can learn to use ‘softness’ which means co-opting your partner, or borrowing energy, in other words using his reaction to help accomplish your objectives. As Chee Soo says in his chapter on sticky hands learn to always go slightly in the opposite direction first then you can take advantage of your partner’s reactions. 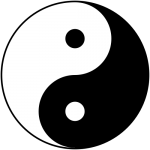 If you think about the Yin and Yang symbol, have you ever wondered about the opposite coloured dots in the middle of each section and what they mean? One interpretation is that at the extreme there is a swing towards the opposite. The Taoists have a phrase, ‘opportunity disguised as loss’, so by limiting yourself to only one hand you are actually making an opportunity for yourself to be more creative with what you do have.